President Donald Trump is currently considering whether to do away with the program, which he had promised to get rid of during his presidential campaign. As the number of attendees near Columbus Circle grew to nearly 1,000, the crowd became more riled up, with folks banging on buckets in time to chants of, "Say it loud, say it clear: Immigrants are welcomed here." Signs that read "Deport Trump" and "Stand up for immigrants" peppered the crowd. Theo Oshiro, deputy director with rally sponsor Make the Road New York, said the program's cancellation would upend hundreds of thousands of lives. "DACA, more than anything, takes the fear out of their everyday lives. Imagine going from one day where you're able to work, able to be safe, to worrying about potentially being taken away from your family," Oshiro said as the protesters gathered. DACA recipient Stephanie Park, 24, echoed Oshiro's sentiment, saying Trump has created an atmosphere of confusion and fear for immigrants regardless of their legal status. "My main concern is that immigrants don't know their rights. There's so much confusion about whether they'll be able to continue to work and live in the country they love," said Park, who immigrated to New York City from South Korea in 1998. "I'm worried that without DACA, I won't be able to continue the work I do and help immigrants; immigrant representation is so important right now." Many ralliers criticized Trump as a demagogue who has unfairly portrayed undocumented immigrants as criminals and inherently suspicious. Supporters of DACA argue the program helps stabilize families and secure jobs for young people. City Comptroller Scott Stringer said he was there to support "our young people who are going to make great contributions to our country." "We do not want them to be pawns in Donald Trump's immigration agenda," Stringer said as he surveyed the growing crowd. Chants of "Love, not hate, that's what makes America great," could also be heard rippling through the crowd before the mass of people – stretching a city block – began to march toward Trump Tower just before 6 p.m. The group marched slowly on 59th Street to Fifth Avenue, coming within a block of Trump Tower at 57th Street before making a right and looping back toward Columbus Circle. Armed with a sign that read, "#DefendDACA Immigrants are #Heretostay," Zakiyah Ansari said she supported the rally because the United States was built on immigrants. "How dare we demonize them," the 50-year-old East Flatbush resident asked. "We don't turn our backs on people in need. That's not what we're about. So even if our president feels that way, we're here to say we're better than that." DACA applies to immigrants who are living in the United States illegally, who came to the country before their 16th birthday, who were younger than 31 before 2012, haven’t been convicted of a felony or major misdemeanors, and are in school, graduated from school or are honorably discharged veterans of the armed forces or Coast Guard. In June, 10 Republican state attorneys general urged the Trump administration to rescind the DACA program, while noting that the government did not have to revoke permits that had already been issued. White House press secretary Sarah Sanders told reporters last Friday that the program continues to be under review. 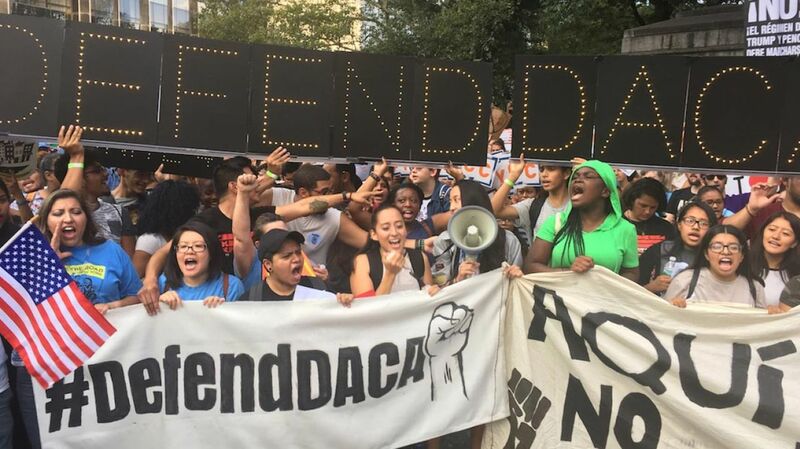 DACA supporters also recently rallied outside of Trump Tower while the president was in town for meetings earlier in August.